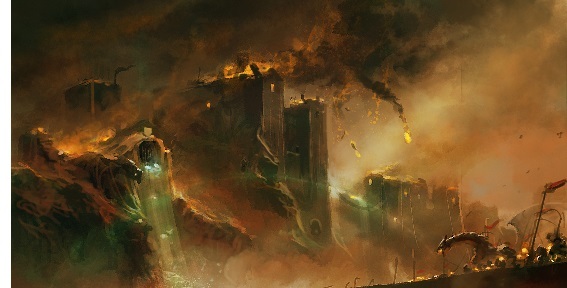 Fall of Nargothrond (495 Y.S.) - In the Year of the Sun 495, Morgoth unleased Glaurung upon the Noldor city of Nargothrond. He was supported by a train of Orcs and they overwhelmed the Elven stronghold. "And in the Autumn of the year, biding his hour, Morgoth loosed upon the people of Narog the great host that he had long prepared; and Glaurung the Urulóki passed over Anfauglith, and came thence into the north vales of Sirion and there did great evil. Under the shadows of Ered Wethrin he defiled the Eithel Ivrin, and thence he passed into the realm of Nargothrond, and burned the Talath Dirnen, the Guarded Plain, between (the Rivers) Narog and Teiglin. "Then the warriors of Nargothrond went forth...but greater far was the host of Morgoth than any scouts had told...and the Elves were driven back and pressed by the Orcs into the field of Tumhalad, between Ginglith and Narog, and there they were penned. On that day all the pride and host of Nargothrond withered away; and Orodreth was slain in the forefront of the battle, and Gwindor son of Guilin was wounded to the death. "In that day the bridge over Narog proved an evil; for it was great and mightily made and could not swiftly be destroyed, and the enemy came readily over the deep river, and Glaurung came in full fire against the Doors of Felagund, and overthrew them, and passed within.